Choose the Disk Cleanup Desktop app from the search results. Choose the mass storage device that you want to clean up. This prompt appears only when you have multiple storage media on your PC. You probably want to choose drive C, the main storage device, which is already chosen for you. The Disk Cleanup utility scans the media, looking for useless files. When it’s done, you see the Disk Cleanup dialog box, as shown. Place check marks by all the items. Seriously, nothing listed in the dialog box is of any consequence to you, yet the Disk Cleanup utility leaves several items unchecked, probably just to give you something to do. Click the Delete Files button to confirm and begin the cleanup process. Wait while the files are removed. When the process is complete, the window goes away. The Disk Cleanup dialog box. For even more aggressive file purging, click the Clean Up System Files button. The Disk Cleanup utility starts over again, but this time it lists various unneeded bits and pieces of Windows. • Check the media’s before‐and‐after size when you run the Disk Cleanup utility. That’s the best way to gauge how successful you are in increasing media capacity. 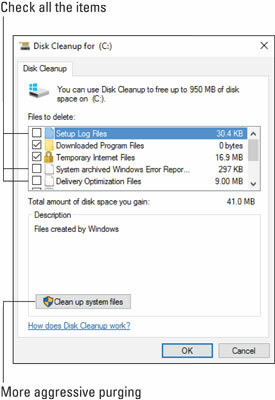 • You can also access the Disk Cleanup utility from a drive’s Properties dialog box: Click the Disk Cleanup button on the General tab. • Rarely will you use Disk Cleanup and have it fix the problem of a crowded hard drive, so you may share some disappointment in its performance. Use this tool in combination with others to help improve storage capacity.